As the weather starts to heat up, so do the trails. 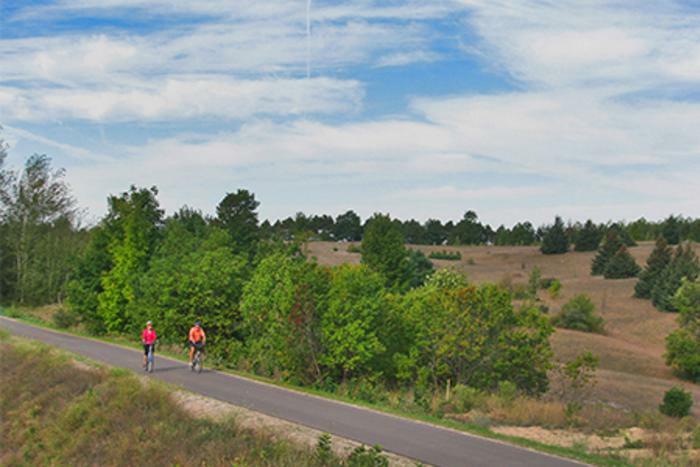 The paved Leelanau Trail spans a full 19 miles, flowing through orchards, wooded wildlife sanctuaries, wineries and open meadows – offering miles and miles worth of biking paradise. Every mile has something new to offer for both experienced cyclists and beginners alike. Ready to explore? I was certainly ready when I got back from college a few weeks ago, and I decided to start my summer off right by taking a ride on the Leelanau Trail. On this particularly humid 80-degree morning I began my ride to Suttons Bay alongside my dad (an avid cyclist) at Clinch Park in Traverse City where the official “mile marker 0” rests. We were pedaling pretty ambitiously, so it wasn&apos;t long before we intersected Carter Rd. 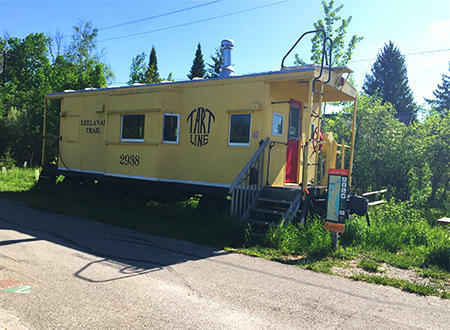 where the first popular icon on the trail resides: the TART caboose, an intriguing piece of history commemorating the old rail bed that the Leelanau Trail was built on. After riding through a canopy of trees and over several small streams we took a break at one of my favorite spots: the DeYoung Natural Area. From the trail, you can see a portion of the old farm it features including a rustic barn and – the coolest part – an old manual water pump. It still works, so you can quench your thirst and fill up your water bottle the old-fashioned way. We also got to see the beginnings of the food forest, which consists of fruit trees, nut trees, herbs and other edible plants. 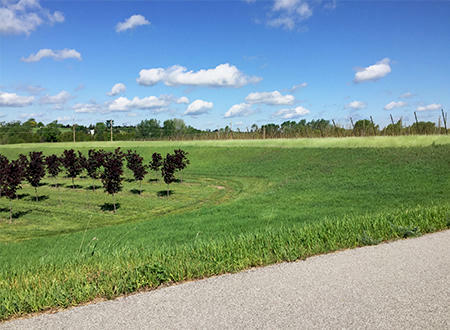 This unique area was created by the Edible Trails Project to allow bikers time to explore, learn, and maybe have a fresh snack. On the opposite side of the trail, there’s a winding boardwalk through the trees which leads to a dock looking out over Cedar Lake. Jump off your bike and go check the area out! You won’t be disappointed. When my dad and I left the shady canopy of the forest, I smelled the sweet scent of wild grass – a smell that always makes me think of fresh air! The next section of the trail that encompasses fields of tall grass is my personal favorite stretch. What it lacks in shade, it makes up for in beauty: the fields are lit up by the sun, shining different colors of tall wild grasses, and the hops and vineyards always bring a sense of relaxation. There are, in fact, many people who are not using the trail for recreation but instead as transportation from winery to winery. It is even marked with little wine bottle signs pointing out wine tasting destinations — a good story for another time. Once we passed through the fields and over a bridge we came to the trail jug stop. Neighbors and long-time trail supporters who live right off the trail have made this destination complete with drinking water and bathrooms — there is even a little sign-in book on the table where we were able to leave a note for future trail users. What a fun idea! We were pretty tired at this point in the ride, since although the trail looks mostly flat to the eye, there are some areas with slight elevation. However just about five miles from Suttons Bay it got a little easier for my dad and I to pedal — it’s almost as though the trail was helping to give us that little nudge we needed to get to the end. As we rolled into Suttons Bay we were surrounded by the shops, restaurants and other cool destinations to explore. After all that biking I was looking forward to sitting down at Village Inn Grill to enjoy a nice lunch on their patio. 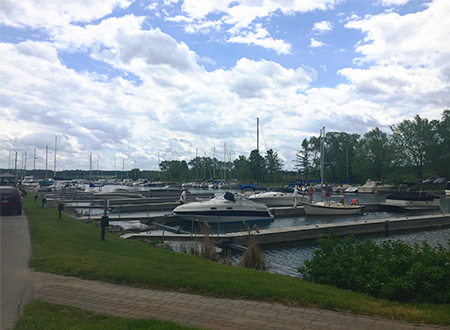 After lunch, we hopped back on our bikes and rode down to the Suttons Bay Marina, enjoying the view until we decided to take the BATA bus back to Traverse City. We had to wait for the bus so we had some time to kill and decided to ride the rest of the trail north towards Dumas Road (the true end of the trail). You can see the water from this section, which makes it especially beautiful on a nice sunny day. My dad and I had planned on using the BATA Bus-n-Ride program, which lets you and your bike catch a ride back to Traverse City for a one-way fare of $3. This service runs from May 21 through October 23. Unfortunately, I read the schedule wrong and the bus we intended on riding back wasn’t coming, and the next one wasn’t coming for another two hours. I hope others can learn from my mistake; even though the shuttle runs seven days a week, weekday and weekend times may vary, so make sure to check the bus schedule or else you might be pedaling your way back — like my dad and I did! But, despite the rain and strong headwind, we rode back smiling. No matter the weather, I am always appreciative of the beauty alongside the trail. It just never gets old. For more information about amenities, directions and parking, you’re welcome to visit the Leelanau Trail page on the TART Trails website. Don’t forget to review trail etiquette before venturing out — stay to the right, pass on the left. Oh, and don’t forget your smile! Happy Trails! Allison is an intern for TART Trails and grew up in the heart of Traverse City where access to the Leelanau Trail was only a few blocks away from her house. She has fond childhood memories of riding up the trail, and although she has biked through it countless times, each ride seems to offer her a new, unique experience.